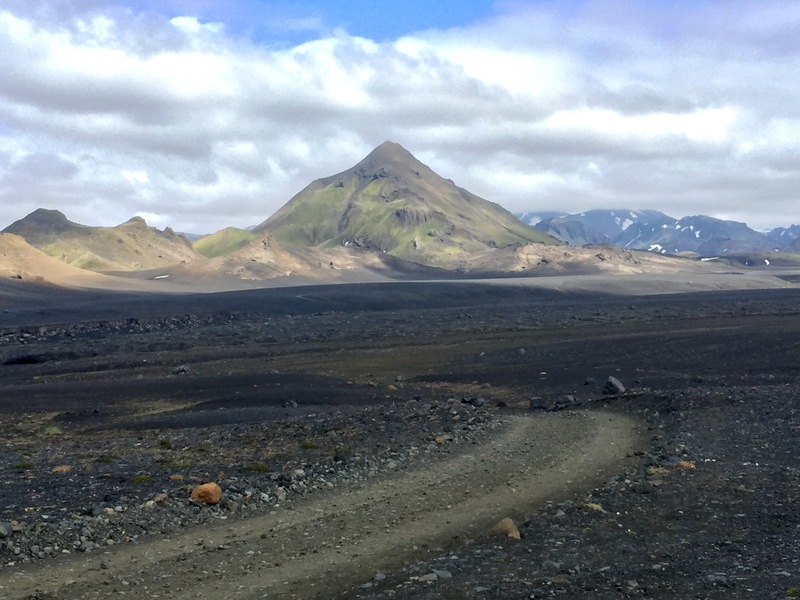 The Laugavegur Trek officially ends at Pórsmörk, but I had planned another 25 km to Skogár. On waking and inventorying my health, I decided discretion was the better part of valor and took my Georgia Tech friends (including Paul Kohn who was with this particular group) up on their offer of a ride back to Reykjavik. It meant an extra day in a hostel but the free ride made that almost a financial wash (buses are expensive). The day’s hike was different from the others as it was almost all an easy downhill grade on firm black gravel (with an occasional soft sand stretch that made my calves ache). As I was moving downstream, the rivers began to run deeper and faster. They were also starting to braid the way they do on the South Island in New Zealand. In this area most crossings were bridged, though there were a few fords. The last one was only three kilometers from the end, so in honor of my Te Araroa tramp, I crossed with my regular footwear, squished my way to the end. Yesterday there were several fords, one a little deep, wide, and very cold (I could see the melting glacier just up the valley). The cramps in my arches made me think of the summer of 1973 when my friends Jerry and Gregg and I painted an old farmhouse with a spring house out back. At lunch we would sit there in the cool, seeing how long we could stand in the freezing water. Like Nietzsche’s eternal return, I found myself standing in both the Grashagavist and an old spring house at the same time. Soon I arrived at Pórsmörk and settled in to wait for the Georgia Tech crew who arrived later that afternoon. Soon we had loaded up the three jacked-up white Land Rover Defenders, jump started the one with the dead battery, and set off driving on rough gravel roads regularly crossing rivers with water up to the floorboards. After an hour of fording we got to hard pavement and soon the rain that had threatened all afternoon came on, confirming my decision to get off the trail that day (the rain and the wind howled all night long but I was snug in a hostel bunk house, happy not to be in a summer tent and instead getting soft in a semi-soft bed). The students stopped for a few hours to explore a cave, so I was late getting to my hostel. Still grateful for a ride, I did regret not getting any supper, consoling myself with a fine nutritious pale ale before sleep. Thus ended the last trek on my year-long around the world walkabout.